Loom extenders for the Mirrix looms are sooooooo neat! 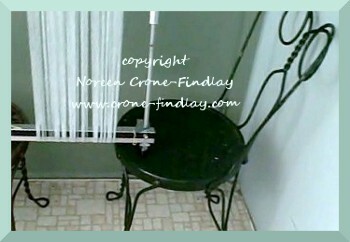 You’ll need to make a few adjustments when you are warping the extended loom. 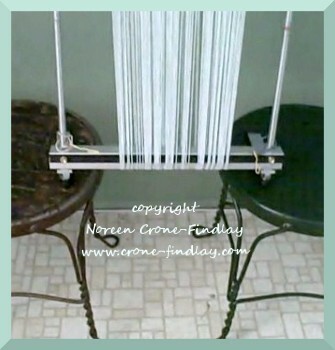 This leaves a gap that allows you to easily pass the ball of warp around the loom. You could use 2 small tables if you would prefer, but I like the height of the chairs. The loom is still happily very stable when it’s extended. One of the other things that I have found while weaving on the extended loom is that the weaving can pull in on you. So, to rectify this, take 2 rubber bands, and 2 paperclips. 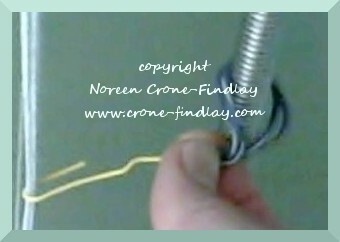 Open the paperclips, fold the rubber bands around the side bars, and squeeze the shorter end of the paperclip closed. Hook the larger end of the paperclip through the selvedge, about a half inch below the fell line. Make sure that the end of the paperclip is towards the back of the loom, as this makes it be less of a snaggle hazard.